Crevasses are cracks that form in glaciers and can range from just a few inches across to over 40 feet (12 m.), and can be over 100 feet (30.5 m.) deep. However, these cracks are usually less than 200 feet (61 m.) deep because the deeper layers of ice are compressed to an almost plastic state that can flow over and around most obstacles without cracking. These great breaks often form on steep slopes, the outside bend of a curve in a glacier and around obstructions in the bedrock. Often at the bottom of a steep slope, where the angle relaxes, the fissures will be closed. This is because the speed of the glacier slows as it flows into the level area, and the faster moving area of the steep slope pushes heavily against the slower, causing them to shut. Crevasses usually run horizontally on a steep slope, and more parallel with the flow of the glacier in the more open, flatter areas. 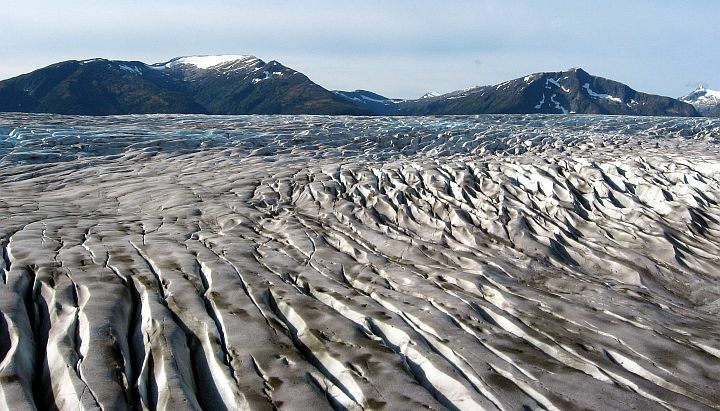 The very large horizontal crevasse at the upper end of a glacier is called a bergshrund. This is where the glacier actually begins as it breaks away from the snow and icefields above. These glacial "dead-fall traps" often get covered with snow, making them impossible to see, which only makes glacier travel all the more hazardous. As far as rescue, avoidance and safety goes — you have no business venturing onto a glacier without professional guidance and instruction. PERIOD!